Every day online you will be faced with an array of tempting free offers. Pop-ups abound with suggestions that you provide your email address and in return you will get a free ebook to download. Or you are enticed into signing up for a newsletter and get a free special report into the bargain. But how much do people value such free items? Anyone who organises events knows that if you run a free meeting you get a substantial proportion of “no shows” – people who signed up to say they would attend, but then never show up. However, events organisers also know that if you charge even a modest fee for the event, people are more likely to turn up. The free event is valued less than one that is even just a few pounds. However, this simple notion that free is perceived as less valuable than something which is paid for is not always true. One study found the reverse – that a free item was perceived as more valuable than the paid for one. The psychology of “free” is more complex than we might think. Many people will fill in a pop-up to get the download, not because that is what they want, but because they see it as a necessary route to what they really want. For some people the download may be enticing, but for many it is just a means to an end. People focus on the ultimate destination of their desire – to get the newsletter or the trial of the product. The free download is just a minor hassle. No doubt you have plenty of free downloads on your computer which you have never got round to reading. That’s because your eyes were on the prize, not the ticket that got you there. So, one way to increase the perceived value of your download is to emphasise its impact on getting your actual offer. Pop-ups often emphasise what you will get from the free download saying things like “to get my free newsletter just sign up here and you will get all of this….” and then go on to explain what “all of this is”, leaving aside any of the benefits of the newsletter itself. The website is putting the value into the free offer and not into the element which people are most interested in – the newsletter. When you emphasise the ultimate aim of the offer – and not the free element – the free item becomes something of a surprise and thereby gains more value, perceived as a bonus free gift that was almost unexpected. 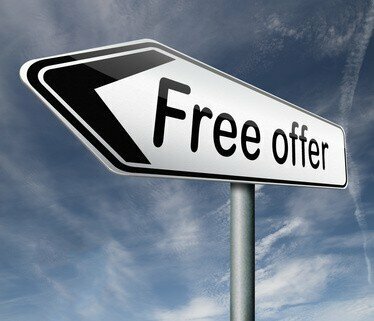 Another potential twist on the free offer status is to allow people to select the free offer they would like. Instead of having a single free download for signing up to something, give people a choice of ebooks or reports they might like to download. New neurological research shows that there is an element of bias in choice selection – when we choose something for ourselves we tend to value it more. This implies that if you offer people one of three ebooks to download free of charge for signing up to your newsletter they will value the free download more than if you simply gave them one. Indeed this choice bias and its association with value may partly explain why sometimes something which is free is perceived as more valuable than something which is paid for. If the user has been able to choose for themselves what they want, they perceive it as more valuable than something which they could only get if they bought it. Free offers are a necessary and vital part of generating leads, but you need to acquire potential customers who value what you do. The way you handle your free offers has a clear impact on perceptions, so to ensure those leads value your business you need to get them to place increased value on your free offers.